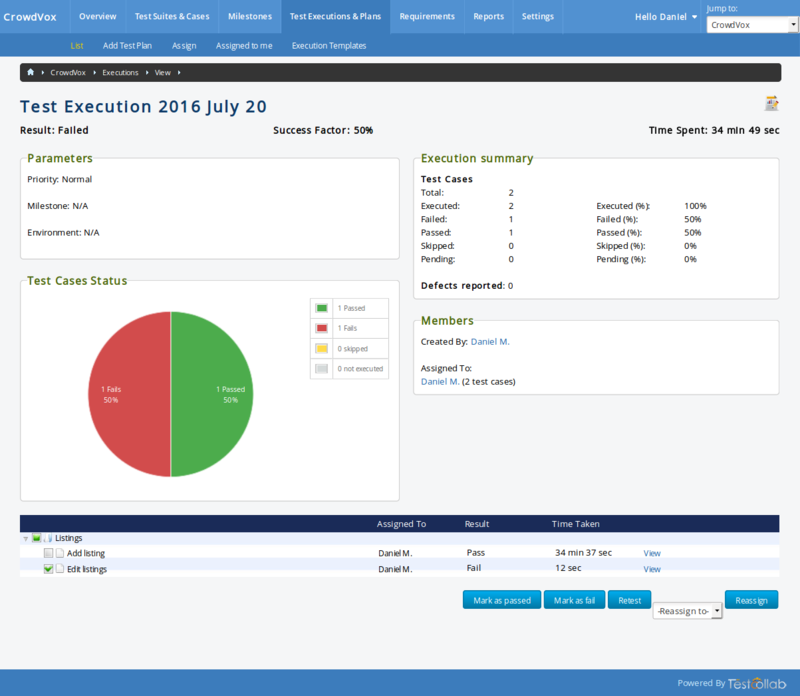 Once a Test Execution record has been created, the details of the same can be viewed on Test Execution details page. Execution Summary with number of test cases present in test execution, total cases executed, passed, failed, skipped, pending and their respective percentages. Number of defect reported (if any) with their IDs. List of Related Members – one, who created the Test Execution record and also the ones who have been assigned the tests. A link to start the test case, either when the tests under defined Test Execution have not been executed at all, or there are some test that have been marked as pending. If there are any unexecuted or pending tests, then user will see a Start Now button on the screen and when user opts to execute, then user will be redirected to a screen where user will have option to do the pre execution settings for the defined Test Execution and then execute it. User, can perform actions like marking the selected test case(s) as Passed or Failed, setting the executed test case(s) for Retest, test cases can even be Reassigned to other tester by selecting the name from dropdown. In short the real team collaboration will be possible with this. If user selects to view individual test case, then he will be redirected to a screen where it would be possible to not only view the test case definition details, but also the results and logs of activities for the test. Once an execution has been completed i.e. all its tests have been executed, user can opt to view a report on the Test Execution. All details shown will be similar to that of Test Execution's view screen. 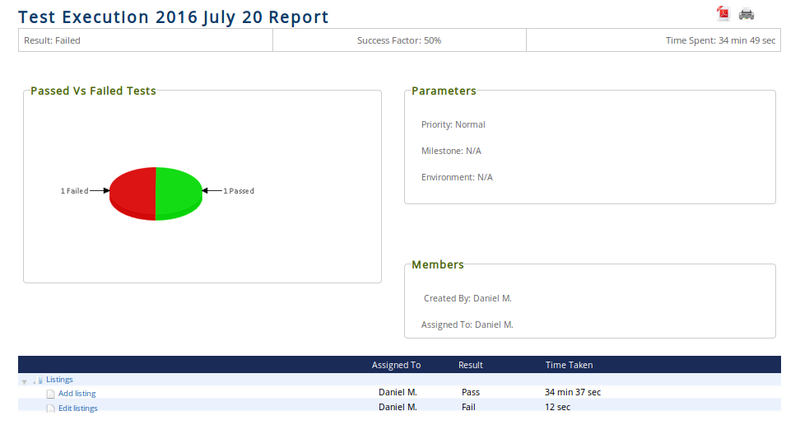 The report contains result, success factor, and time spent for test execution. Graphical representation of test results along with parameters, members and executed test details. Users have options of getting the report exported in PDF format, also the same report can be printed from being on report page only using the icons provided on top of the page.